While reaching developers is challenging, it’s definitely not impossible. While reaching developers is challenging, it’s definitely not impossible. Gaining a developer’s trust is paramount, and you can do that by positioning your product in an authentic, engaging manner. We recommend the following activities as stepping stones toward success in marketing to developers, especially those on DZone.com. We’ve found this to be the most important tactic for software marketing success. Marketing to devs starts with building trust, and you do that by proving you have the expertise to help them solve their problems. You may not have development expertise as a marketer, but likely someone in your company does. Lean on the subject matter experts (SMEs) in your organization to give you that “insiders” voice. Not sure who to ask for technical content? The organizations that are most successful marketing to developers have their own development teams regularly create content for other developers. Titles of good potential SMEs include Architect, Lead Developer, and Senior Software Engineer. Work with your own tech or IT department to identify the best SMEs for the particular content you’d like to use in your marketing materials. Which marketing formats are most suited to Subject Matter Experts? In our experience, articles and blog posts (particularly tutorials), white papers, ebooks, and webinars are best for sharing the knowledge of SMEs in an accessible way. 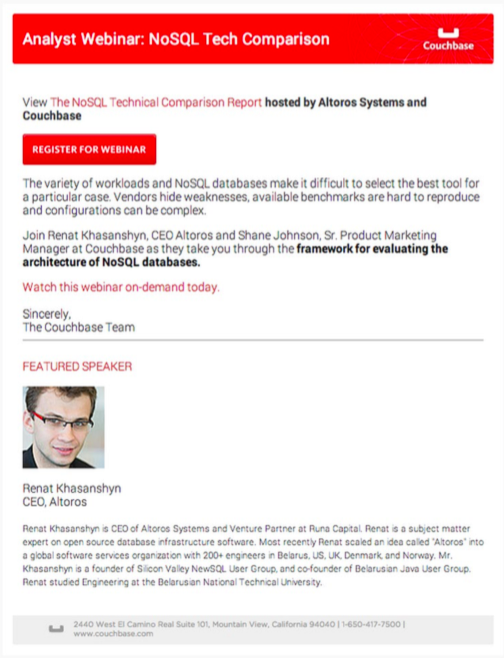 Couchbase saw an impressive response to this email promoting a webinar that featured two SMEs: the CEO of Altoros and the Senior Product Marketing Manager at Couchbase. Make your developer-focused marketing materials as clear as possible. Keep content concise and easily skimmable. If something is particularly important, highlight it with a different font or color. If you’d like a developer to take a specific action, make the CTA easy to find and make it stand out. Use your brand to your advantage by creating easily recognizable ads that reflect your particular style. This visually stunning banner ad from TargetProcess grabs the reader’s attention and has a clear call-to-action in the middle. The colors and clean design appeals to readers and mesh with the brand aesthetic. This is one of our best performing banner ads, with a click-through rate more than twice the site average. Rather than relying heavily on traditional sales tactics like cold calling, pitching, and canned demos, base your marketing activities on engagement-focused goals. Share content, educate your potential users, and offer open lines of communication and feedback. Interact with your target clients on social media, highlight their content and success stories, and answer any questions they may have quickly and accurately. Do so authentically, without being overly promotional of your own company or product. Where do the developers you want to target hang out? Is it online forums, developer communities like DZone, Meetups, conferences, LinkedIn groups, or some combination? and influencer in that space. By “you,” we don’t necessarily mean you personally. Likely it will be an SME from your company (and someone without a marketing title) who becomes the influencer. However, your marketing team can still provide guidance, materials, and suggestions for success. 5. Give out Free Stuff! This is a tried-and-true strategy for a variety of target markets but is especially successful among developers. Offering free content, free access, and free trials is an easy way to get a developer interested in your product or service. If your product includes a “freemium” version, introduce that option early in the marketing process. “Free stuff” doesn’t have to be limited to products and content. It can also include free food, free gifts, and even giveaway drawings. Do some research into your target market’s favorite freebies and build up a supply to use as giveaways. Developers love to learn! 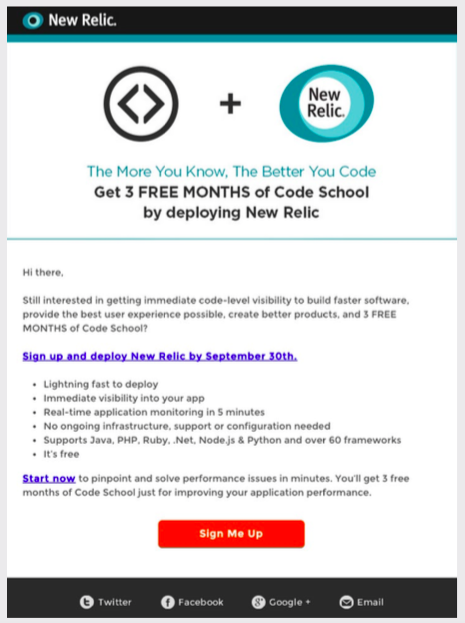 This email campaign from New Relic received twice as many opens as the average DZone email by offering free code school in exchange for deploying their product. Developers respond well to marketers they find trustworthy. How do you build this reputation? By becoming an influencer, focusing on engagement, and leveraging company SMEs. Oh, and by offering free stuff. Want more developer marketing tips and tricks? Download the DZone Marketing to Developers ebook.